This month, the Santa Clara County Public Health Department launched a new campaign aimed at decreasing families’ sugar intake by promoting healthier beverage consumption. 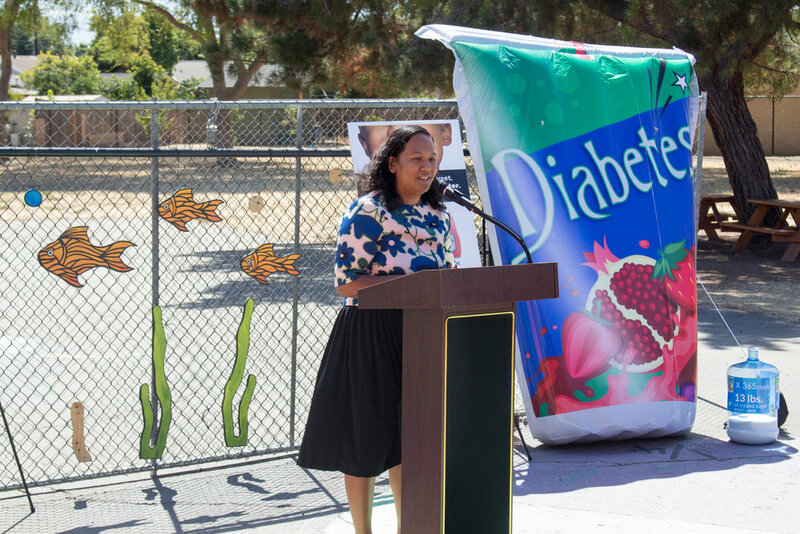 They celebrated the new campaign, titled “Cut the Sugar,” with a press conference and afternoon filled with activities and healthy snacks for the community. First, thank you for letting me share my experience with you. My name is Karina Gallardo. I have 2 kids--- Kaira, who is 5 and Joel, who is 3. I have participated in many FIRST 5 workshops: Opening Doors, SEEDS, Triple P, and We are Leaders. SOMOS also sent me to a nutrition training. In all of them I learned the importance of good habits and good routines. The most important thing I learned was to not give sugary drinks to my kids--- I was amazed to see the amount of sugar that kids consume in a year--- it’s sad! I learned about the harmful effects that sugar can cause, like obesity, diabetes, heart disease and other chronic diseases. I’m glad that SOMOS is always reminding us about the importance of cutting sugar by providing healthy snacks, fruit and water during their events. I apply this knowledge with my kids by not buying them sugary drinks at the store. We don’t have any in our fridge, because if it’s there, they will drink them. My kids have learned to only drink water and low-fat milk because it's healthy. They like sugary drinks like any kid, but they also know that they are not healthy. They know the consequences can be bad--- like having cavities or other pain. It’s hard to keep my kids away from sugary drinks because of all the advertisements in stores and everywhere else in the world. Like I said, it’s hard, but it will be even worse to deal with obesity, diabetes, or other diseases. The benefits of not having sugary drinks at home are that my kids are healthy and have no cavities; they aren’t hyper all the time; and most importantly they understand the unhealthy consequences of having too much sugar. I want to thank everyone who has supported our kids and our community by being a part of this “cut the sugar” campaign. Thank you to FIRST 5, the Public Health Department, SOMOS Mayfair and the leaders who made this possible. SOMOS Mayfair is proud to support this campaign, and we appreciate that the Public Health Department made sure to include community voice and input during every step of the campaign launch. We are proud of the Promotoras who helped to develop key messaging, to set community priorities, and to create marketing props and materials that were used at the event and will continue being used by the county for the campaign’s duration. And we are especially proud of Karina, who shared her story and inspires us to continue working until every child in Mayfair has access and opportunity to live a healthy, vibrant life. We look forward to the many ways community voice and priorities will continue to be highlighted and invested in---- thank you to Santa Clara County for bringing this vision to life!